His donation of 548 paintings, drawings and works of graphic art was in fact "in exchange" for the building of his own museum. Construction began in 1965 and the gallery was opened to the general public on 2 July 1969 as one of the facilities of the Slovak National Gallery. The artist spent the final years of his life here. A new permanent exposition was opened to the general public after reconstruction that took place in spring 2009. It introduces Fulla's key works from the property of the SNG, as well as from donations to the SNG - GĽF in a new selection enriched by works not exhibited for a longer period of time, such as examples of "realistic" painting, which Fulla practiced in the 1930s, and certain lesser known works from the final period of his career. The exposition was also enriched by texts with Fulla's comments. Visitors to the permanent exposition will find paintings, tapestries, drawings, graphic art and illustrations; the master's studio and office are also open to the general public. Ľudovít Fulla (27 February 1902 - 21 April 1980) studied at the School of Applied Arts in Prague (1922 - 1927, under prof. Arnošt Hofbauer, František Kysela). After 1927, he worked as a pedagogue in Slovakia; from 1929 - 1939 he was a professor at the progressive School of Arts and Crafts in Bratislava. 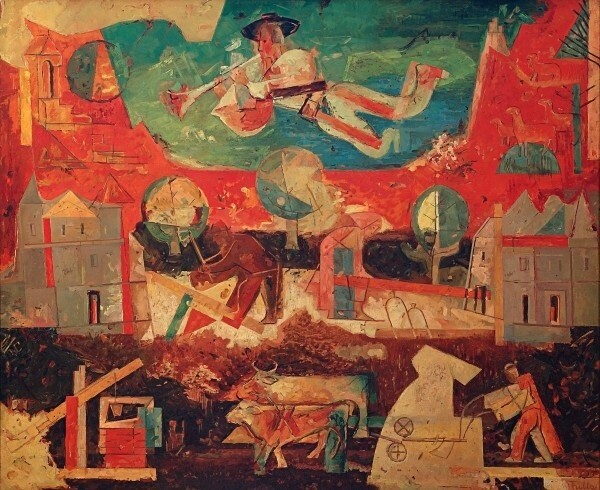 In 1937, he was awarded the Grand Prix at the world festival in Paris for his painting entitled Song and Labor. From 1949 to 1952, he was the head of the department of monumental-decorative painting of the newly established Academy of Fine Arts in Bratislava, which he left due to political reasons. From 1962, he lived and worked in his native Ružomberok. He worked in the fields of painting, graphic art, drawing, typography and stage design, as well as in the areas of book illustration, tapestries and monumental works for architecture.